As a member of the 20-something club, I understand more than ever how it hurts our wallets to indulge in Thai food solo. 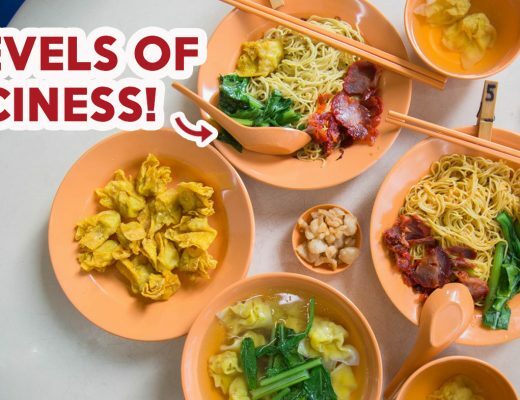 When the makan kakis are not free, ordering just a rice and a dish would be too little to quell cravings, while ordering more would be expensive, or too much for a party of one to finish. 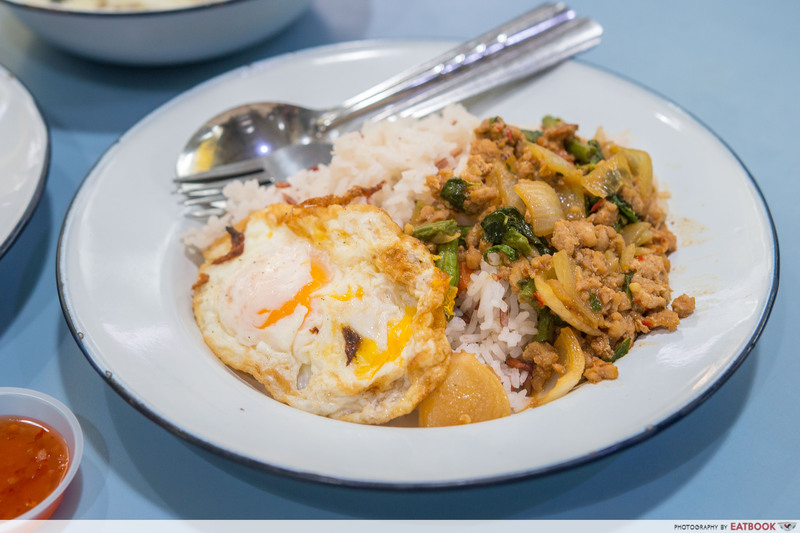 Thankfully Basil & Mint has solved this problem, making it easy for lone rangers to have a combination of Thai dishes all on one plate. 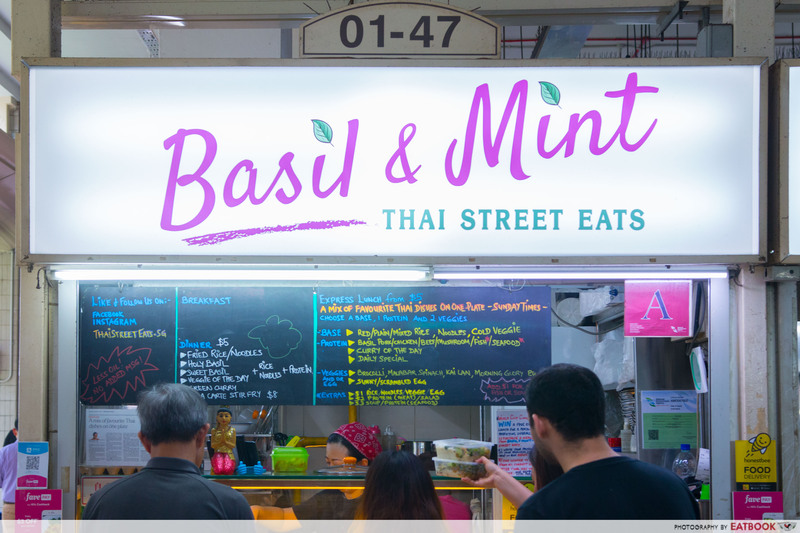 Ordering at Basil & Mint works the same as any cai png stall. Prices here are also relatively cheap. Every serving of rice, noodles, vegetables, or egg costs $1. 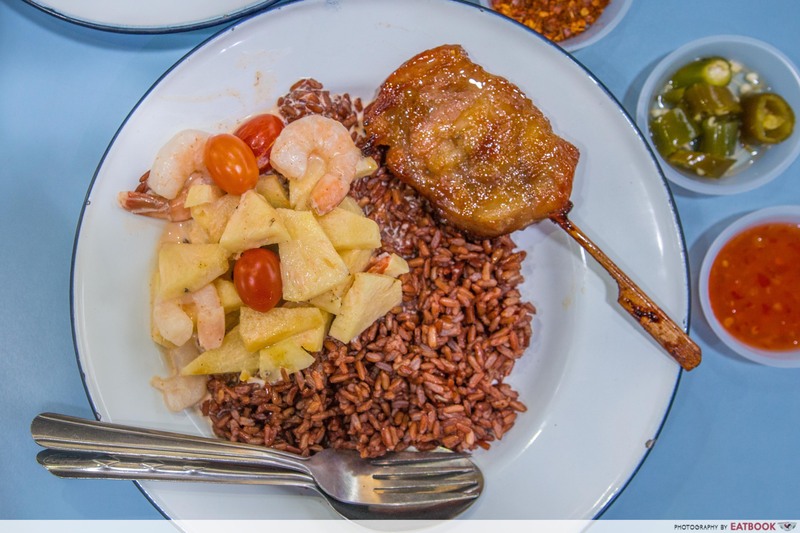 A meat or salad side costs $2, and a portion of soup, curry, or seafood costs $3. Basil chicken for me is a must-order at any Thai eatery. 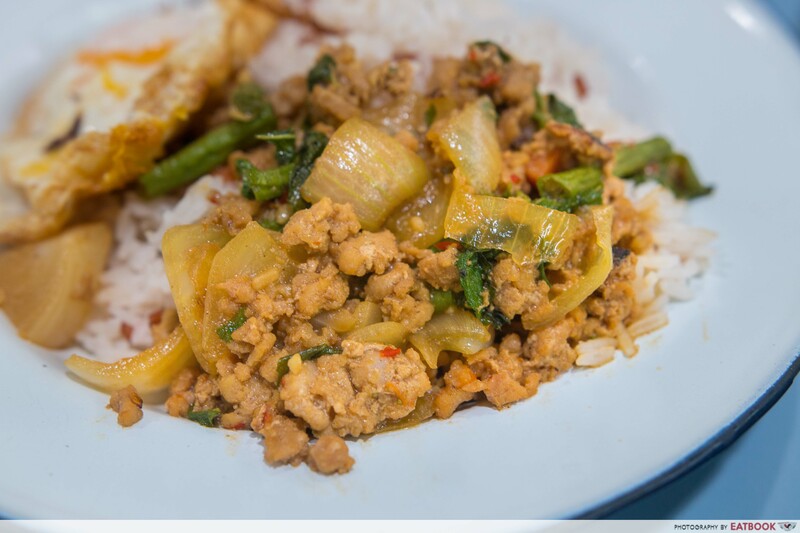 And Basil & Mint offers two kinds – holy basil and sweet basil chicken, with the former being spicier. As someone who appreciates a bit of spice in my food, I got the holy basil chicken and a sunny side up with white rice at $4. 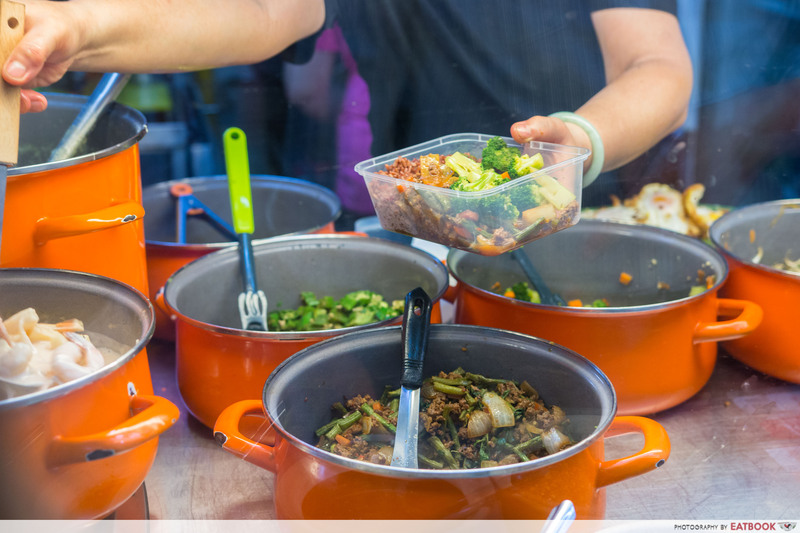 Other carbs offered at Basil & Mint include red rice, mixed rice, noodles, and cold vegetables. Despite ordering plain white rice, we were served a bed of white rice speckled with red. This brought a smile to my face, as it reminded me of my health-conscious mother, who insists on adding in a portion of red rice to our white rice at home. The holy basil chicken surpassed my expectations. Holy basil leaves alone can be a strong, overbearing character in a dish. But here it lifted and tempered the chopped chilli and minced chicken, making each spoonful utterly delicious. If you’re looking to have an aromatic dish, this does the job and more. 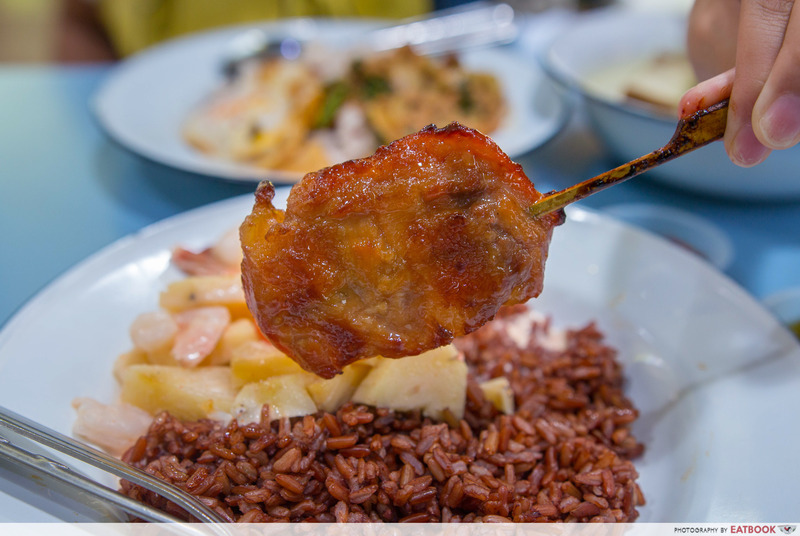 For our second plate, we got red rice with prawn pineapple curry, and a stick of moo ping (Thai grilled pork skewer). This plate set us back $6, but if there was more moo ping left, I would have happily paid $2 more for another. We were there at 1pm for lunch on a weekday, and there was only one stick of moo ping left. The Thai grilled pork skewer was calling out to us from the array of dishes, and I prayed hard that those queuing before me wouldn’t snap the last one up. Sinking my teeth into them only confirmed my thoughts on how succulent it looked. It was slightly charred, yet both sweet and savoury at the same time. I could only wish for more. 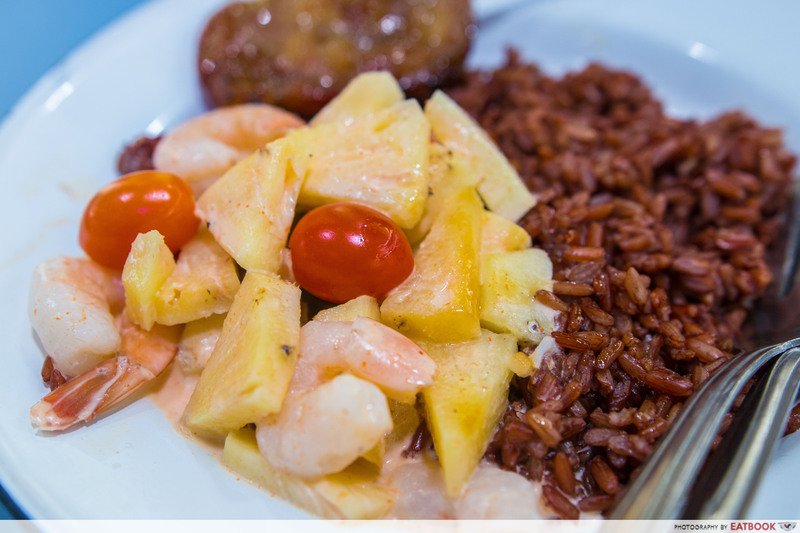 We were intrigued by the prawn pineapple curry as it was in a pretty pink hue. The curry was mild and milky, and thinner than the usual Thai curries we were used to. The addition of pineapples also turned an otherwise ordinary curry dish into something exceptional. 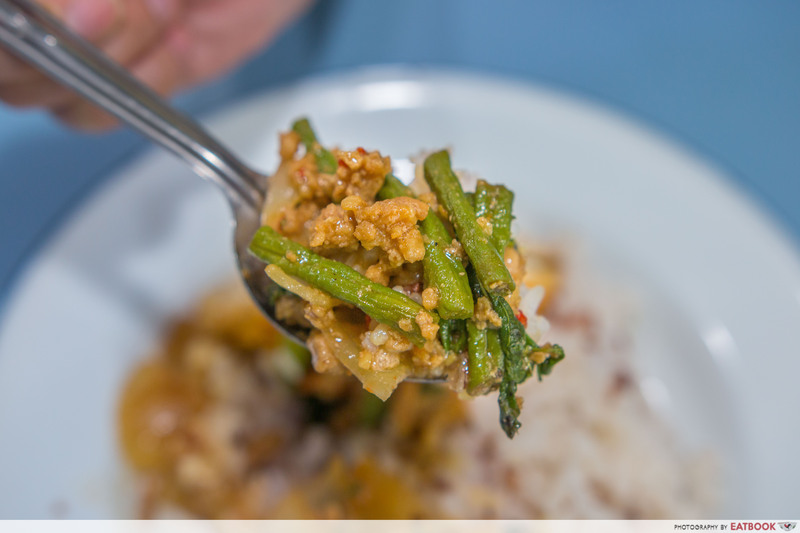 Leaning towards the sweeter side, this curry is great for kids or for those with a sweet tooth. Our cravings for Thai food still ensued and we decided to get a bowl of green curry ($3) as well. The portion was generous. It came in a full-sized bowl with chunks of chicken and eggplant. Sadly, the green curry did not rise up to expectations. I was expecting to taste the usual bold spices and flavours, but was merely greeted by the taste of coconut milk. 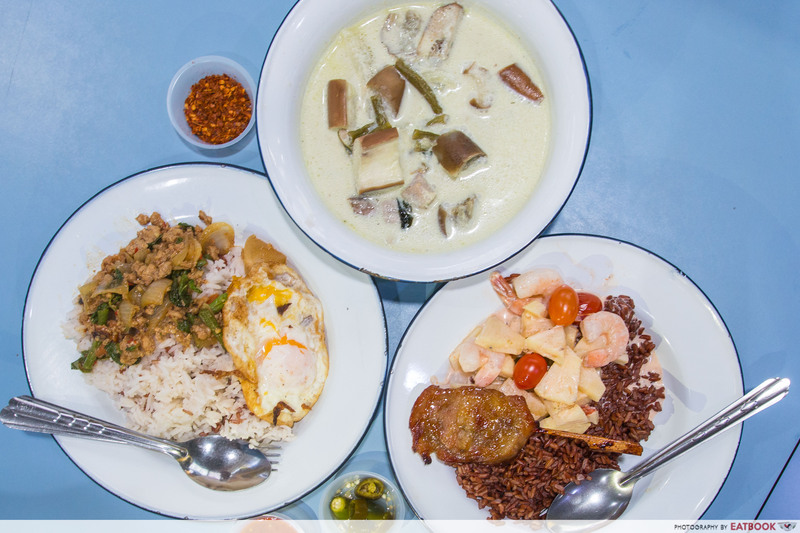 Amoy Street Food Centre has no lack of good and cheap eats. Office workers around the area are definitely #blessed to have Basil & Mint as an option for when lunch or dinner time comes around. Finding a table at the food centre during lunch, however, is especially difficult. We were there on a weekday and had to wait for a good 20 minutes before we got a seat for two. 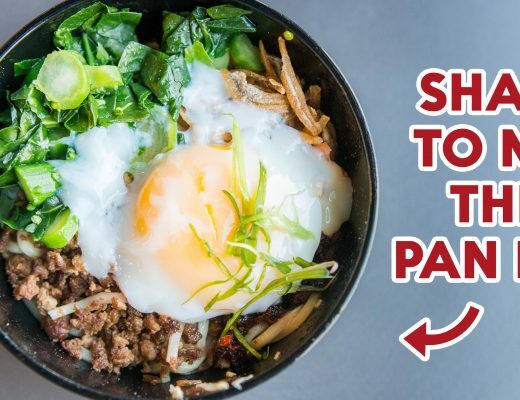 We recommend dapao-ing or coming during dinner time instead. Thai food from $4 a pop is definitely a reason to head back down to Basil & Mint again. The lady boss, also the chef, wishes to provide her customers with nutritious and delicious Thai food. 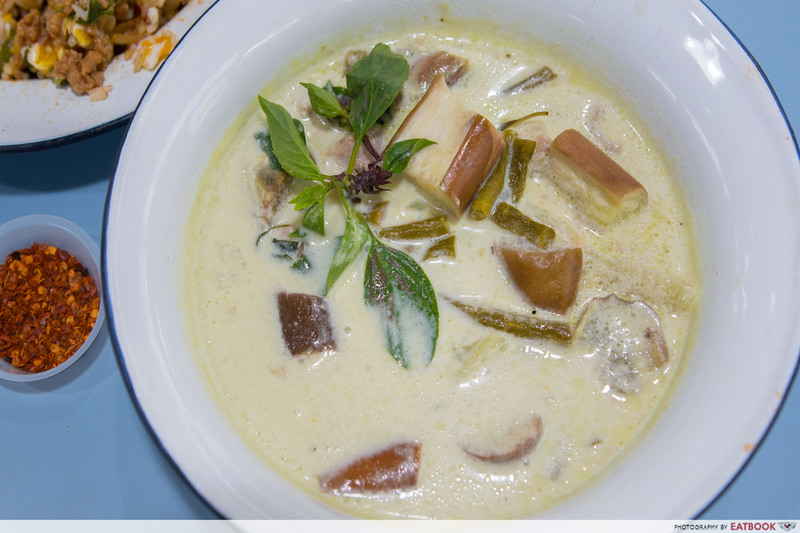 This might be the reason why dishes such as the green curry are lighter in flavour than usual. Whether you are working around the area or not, the good and cheap Thai food here definitely renders a visit. 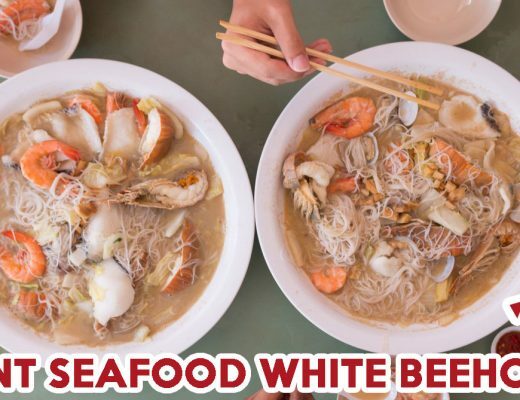 If you are looking for more food around the CBD, check out our reviews on Burger Buddies, which serves large and affordable beef burgers below $10, and Qi – House of Sichuan, a Michelin-starred restaurant famous for ma la dishes.